Trans medical care = mutilation? Trans Etiquette: When is a Compliment Not a Compliment? 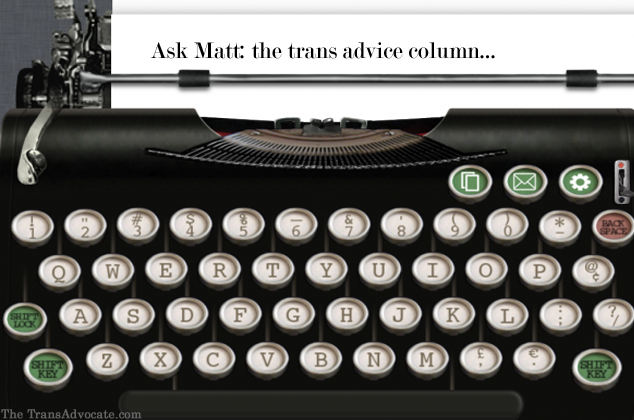 Ask Matt: Can a Gay Man Love a Trans Woman? Ask Matt: Would a Genderless World Affect Transition? “For as long as I can remember I have not exactly considered myself a girl. When I was little I was the one people called the ‘tomboy.’ It wasn’t until I was about twelve that I really began to become uncomfortable with being female. I was physically female, but my brain didn’t seem to think so. “Last year I went to a summer camp out of state, where I got to meet people of different backgrounds. It was there that I met a young woman who told me to do some research on the term ‘transgender,’ which I had never heard of. “The relief I felt when I realized that I was not a random, lonely freak of nature was immense. When I started my sophomore year in high school I started referring to myself as ‘he’ on the Internet. I went through a short time where I simply considered myself genderqueer, but at this point I am certain I am transsexual. 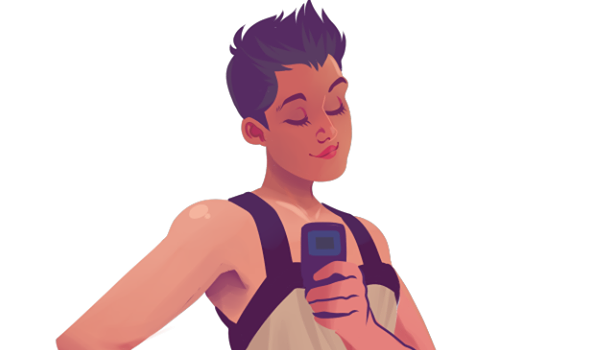 “Last year at some point I came out to my mom as being transsexual. My mom refuses to accept that I actually could be a transman. My mom is getting better slowly. She does get very angry when I try to bring it up a little bit, when I mention that I’d like to tell our family doctor, or that I’d like to talk to a therapist about it. She does buy me boy’s clothing now, and after a heck of a lot of pestering on my part she agreed to buy me a breast binder (if only to get me to shut up). “My first concern is trying to explain to my mother that gender identity and sexuality have very little, if anything, to do with one another. I am pansexual. Then there is the problem with trying to explain that I am not too young to know my gender identity. I have asked my mom is she would just do research, or let me show her articles about transsexuality and gender identity, but she won’t have any of it. “My next concern is to do with high school, sort of. This is my junior year in high school and it will be starting in a few weeks. All of my friends are aware that I identify as male. So now my concern is what I should tell my new teachers. I cross dress, am going to start wearing a binder soon, and have my hair cut into a typically masculine style. I very badly want to introduce myself to my new teachers as ‘John,’ but I don’t know if my junior year in high school is a good time to do that. I substantially edited your letter for length, but the gist is there. I see these problems as interrelated in a way, and I see the primary solution as getting your mom on board. But before we deal with that, let’s look at the school. You might be fine going to your school and asking your teachers to call you John and use male pronouns, and they might actually do it. In your longer letter, you said that you thought some teachers would be supportive. But I also don’t know what your school’s policy is and whether or not they have dealt with this type of thing before. Some schools might have a policy of not acknowledging a student’s name and/or pronoun change without parental blessing. They might be afraid they could get in trouble for doing this (primarily from the parents). Your teachers might not know what the school policy is, so I would recommend starting with the guidance counselor (he or she might not know, either, but it’s a centralized place to start, rather than going from teacher to teacher). You could go to the guidance counselor before classes even start – that person is probably there the week before school starts for planning purposes – and ask what the policy is and how he/she could help you go to the teachers and talk to them about using your requested name and pronoun. Your legal name will show up on class lists, but if the guidance counselor sends a note to all of your teachers ahead of time asking them to use your preferred name and pronoun in class, that will help. I don’t know what you want to do about the restroom and locker room, but your school will likely have a policy about that, as well (or they will have to put one in place quickly). That’s why having one point person at the school, like the guidance counselor, who is working with you on all this can help things fall into place. Now, if you just want your teachers to use a chosen “nickname” for you at the present time, and you are not concerned about pronouns, bathrooms, and so on, you can just wait until they call roll, then when they say, “Mary Smith,” you can say, “That’s me. I go by John.” And that’s it. Hopefully, they won’t question it, and it would be the same as if they said, “Samantha Smith,” and you said, “I go by Sam,” or whatever. Lots of people have nicknames. But it you want the whole shebang, with pronoun change, bathroom and locker room changes, and so on, I would say that you need to get on it and start talking to someone now. And that’s why I also say that it’s important to get your mom on board. Because if the school refuses to do anything major without parental permission or involvement (which is quite likely in the case of bathrooms, locker rooms, and even pronouns), then your mom will need to intervene – and she’s not ready to do that yet. Once your mom is on board, even if she’s not happy about it, she can work with the school and with your dad on your behalf. I would strongly recommend that you don’t wait until you show up at the door after a year on hormones to come out to your dad. If you are planning to start hormones when you go away to college, then my advice would be to come out to him before that. But you are just starting your junior year of high school, so you’ve actually got plenty of time. Your longer letter made it clear to me that you are overwhelmed by all of this. I suggest that you take a breath and break it down into steps. The first step is deciding how far you are ready to go with your school. Again, if it’s just a “nickname” (which is really your chosen name) that you want used, that’s not a big deal, and you just tell your teachers that you want to be called a certain name. They can start doing that, and that buys you some time to come up with the rest of your plan. Then set it down and walk away. She can either leave it laying there for your dad and everyone else to see (which she won’t), or she will pick it up and hopefully start thumbing through it. You can leave other stuff for her as well. Don’t pressure her and don’t stand over her. Just leave stuff and walk away. Let her look at it on her own time, when she feels that she is ready. These things take time. Be patient. Your goal is to gradually get her on your side, or at least supportive enough that she can intervene with the school and with your dad, when and if this is necessary. You might decide that you want to start your junior year with just your new name, then start your senior year with a different pronoun, bathroom, and locker room. Or you might want to worry about the bathroom and locker room stuff, and even the pronoun stuff, when you start college. And if you’re seriously worried about your dad “taking out” his anger on your younger sister after you go to college, especially in a physical way, you and your sister need to talk about a safety plan for her – calling you, reporting to your mom, going to a friend’s house, calling Social Services, or whatever is necessary. But for now, write down your plan of attack, one step at a time with specific time frames for what you want to have happen. When you break it down into smaller pieces, it becomes less overwhelming and easier to tackle. Ask Matt: What is My Sexual Identity?